Once you come down off the adrenaline high of Black Friday, it’ll hit you. You forgot to get something for the cousin you only see at Christmas each year. Or you didn’t pick up something for that stupid office gift exchange. Since you’ll always be blindsided by at least a couple holiday gifting situations each year, you might as well stock up now, especially when you can get cool stuff like this at up to 65 percent off. And not one of these items is over $50. Load up! We’re all reliant on tech, even the outdoorsmen. The SolarJuice battery makes sure your phone, your tablet or any other USB driven device never dies out there on the frontier. It doesn’t even need to plug in to do it — this 26,800mAh capacity battery fills up on solar energy from the sun for all of its power needs. It’s compact, resistant to water, dirt or shocks and even comes with a built-in flashlight…just in case. A $99.99 value, get it now for more than half off. 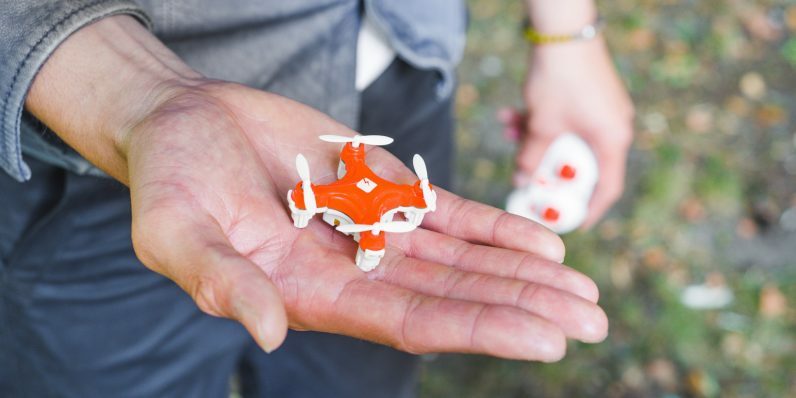 Tool through the skies as the commander of the world’s smallest camera drone! Packing an HD, Wi-Fi-controlled camera, gyro sensitivity, and a 6-axis flight control system, the SKEYE Nano 2 will not only have you capturing amazing aerial footage, but also pulling incredible aerobatics in no time. Even complete novice flyers can grab the stick immediately with auto take-off and landing thanks to Ready to Fly technology. For a limited time, take $20 off the price and get the SKEYE Nano 2 for only $15.20. Engineered for multi-hour comfort, these headphones are ready to go whenever you are. Sporting Bluetooth 4.1 connectivity, an IPX4 waterproof rating, and up to 8 hours of play time per charge, the XR100s have commuting, hiking, biking, traveling and basic living handled. They’ve even got a built-in mic for answering calls and multi-device pairing so you can switch them between various devices without constantly re-syncing. They come in four different colors and right now, they’re $8 off. What good is an ultra-organized set of keys if you can’t remember where you left them? The KeySmart Pro sports a slick, stainless steel body that houses up to 10 keys for easy storage. In addition to other features like a powerful LED light (and even a bottle opener! ), the KeySmart Pro is tough to lose. Just sync it to the Tile app on your phone and the app shows you your keys’ last known location. For Black Friday, you can also save $20 when you pick one up. Here’s a wireless security camera as concerned with your data security as the security of your home or office. The iPM World offers complete video encryption, ensuring your footage is protected and remains away from any prying eyes. Build for shooting full 360 degree views, you can use your phone to rotate your camera whenever you want to get another view of the room, no matter where you are. We also added an extra $96 price drop on this camera…because it’s the season of giving!